Soil sampling and geophysics1 is applied by the mining company’s geologist in order to detect the presence and position of an ore body (i.e. an anomaly). When an anomaly is found, the mining company will initiate a drilling program in order to test the extent of the mineralization. The drilling program is followed by an assessment if the project could potentially be economically developed, based on the drill results. A drilling program is often divided into a step-out drilling program and an infill drilling program. Step out drilling programs have a fixed starting point from which they intend to expand the mineralization zone. The bigger the size of the property the better. Infill drilling programs are used to confirm the presence of mineralization between the step-out drill holes. When drilling under an angle, the slant of the mineralization is being tested. After a geologist has defined the drill targets, based on a thorough analysis of the various exploration techniques, a drilling program is initiated in order to test the potential mineralization in the Earth’s crust. Of course, the drill program has to confirm the presence of the sought after mineralization. Further, it has to determine the shape and continuity of the minerals found. Core samples are taken from every drill target of the drill program. These core samples are then split vertically: half is sent to a lab in order to test the mineralization. The other half is stored for future reference. 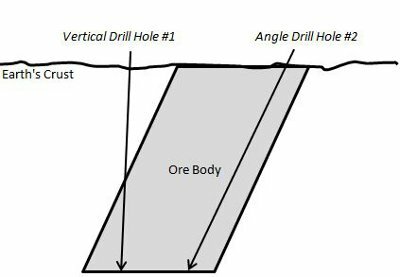 As the orebody is often not just horizontally positioned beneath the surface it is very important to understand the slant of the mineralization in order to determine what angle to drill at. When a mineralization is horizontally positioned beneath the surface, vertical drilling can be executed. 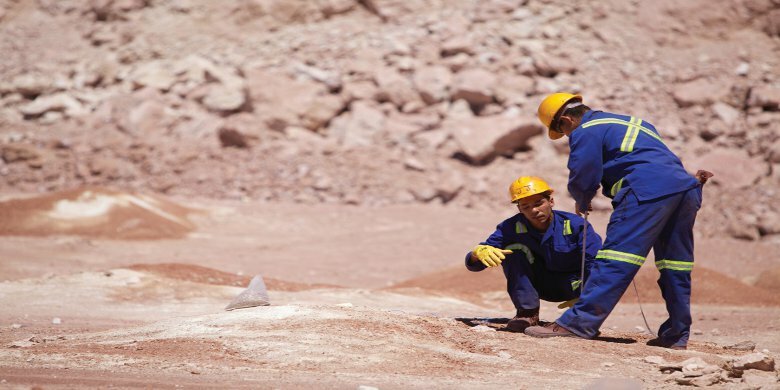 Consequently, it is very important to understand the direction (strike) and dip of the mineralization when interpreting a mining company’s drill results. In order to explain this more clearly see the figure below. Corebox empowers mining investors to visualize drill results through their interactive 3D models, which you can find on their website by clicking the link provided. I recommend you to take a look at the “Properties” section on their website. Here, you can browse by company name, mineral project and by country to see which mining companies use Corebox to visualize their drill results. Keep in mind that mining companies who use Corebox had to pay a one-time setup fee of $500, and they have to pay an on-going monthly fee of $400 to maintain their public display.